Let’s get rid of video umpires by changing the definition of a goal. Today’s high-definition slo-mo replays put umpires under significant pressure to make the correct call. In earlier times, players and barrackers might get upset about a perceived bad call but had no proof to point to, and having a tough decision go against you was acknowledged as the luck of the game. Now that proof is readily available for any incorrect call, the AFL has responded by introducing video umpiring for some decisions. This takes some of the pressure off umpires, but it introduces unsatisfying delays and still doesn’t provide certainty. One solution would be for everyone to change their philosophy – to come to grips with the idea that what an umpire sees is all that counts. 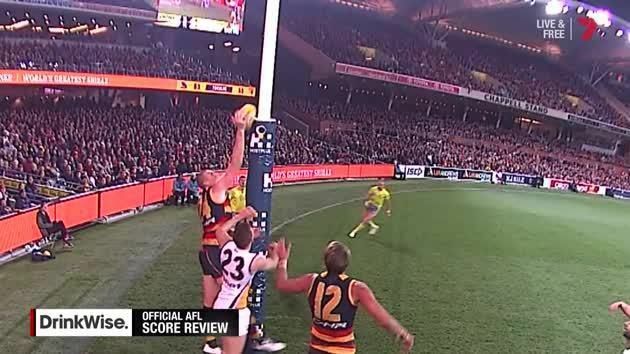 That if a goal umpire determines the ball had touched the post (but the video shows it didn’t) we shrug and put the blame on the player for not kicking more accurately, for not doing enough for the umpire to be satisfied. Of course, that will never happen. We’ve always blamed the umpires and we always will. The simplest palatable solution, then, is to remove some of the difficult decisions entirely. So what if it did brush the post? Did it go through the goalposts? That’s enough for me, give them six points and go back to the centre. If the ball hits the post and bounces back into play things get a bit trickier. We could play on, as was trialled in pre-season games, but the smallest change would be to award a behind in those cases only. Do we really need to deny someone a goal if their opponent brushed the tip of their pinky finger against it? Why do we reward defenders who couldn’t stop the ball from going through? If the primary driving force behind the goal was an attackers foot, and there was no non-foot assistance from a teammate (headers or hands-of-God), let’s call it a goal. Similarly, why does it matter if a kick was touched off the boot when awarding a mark? The defender didn’t smother it enough to prevent it going the required fifteen metres. Let’s get rid of the touched-off-the-boot restriction. The excitement of a Friday night score review! I won’t have considered all the ramifications of my suggestions, and I’m not wedded to them. It also wouldn’t solve line-ball problems – that’d remain the issue it is in so many other sports, and only billions of dollars or my suggestion for a philosophy change can fix that. The idea I want to promote is that it’s better to remove or simplify the existing laws to achieve an objective than to add more technology and processes to do the same. My suggestions may raise the hackles of traditionalists, but Aussie rules is already a very different sport to the one they watched and played as kids. Is a slight change to the definition of a goal as bad as requiring video validation for every scoring decision? If you have an online gambling account that hasn’t been closed or severely restricted, the company believes you are a loser, and is treating you like a mug. Travis, cobber! You told me that the final whistle is never the final whistle. That the turnstiles would never stop turning. That the cheering goes on forever. 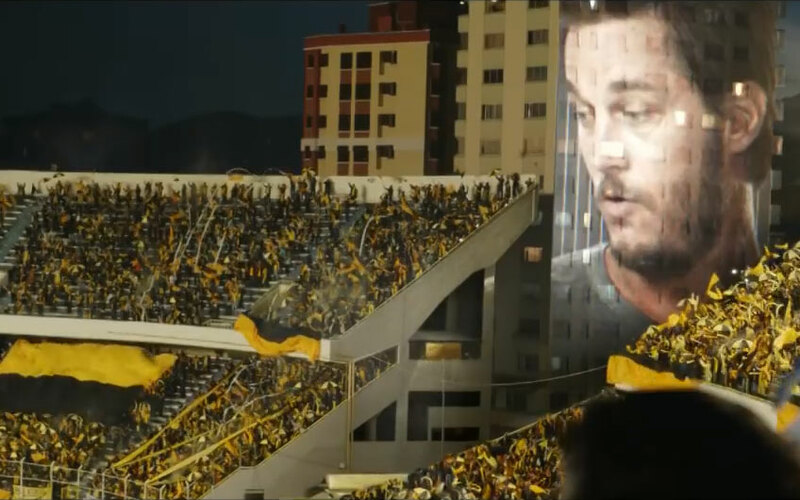 That we were part of something big. Travis enjoying a nil-all draw between two failed states, probably. But I’ve been shut out, Travis! What did I do wrong? I need to charge my phone. I did OK, but I’m no David Walsh. 4.2 bet365 reserves the right to close or suspend your account at any time and for any reason. “Any reason” in this case seems to be that I won more money than I lost. 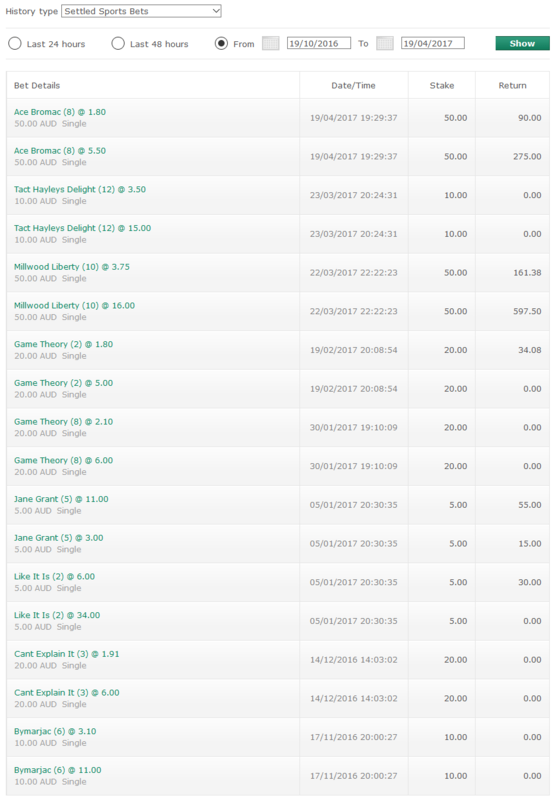 Staking $380 over six months for a return of $1257 makes me an unacceptable punter. If you have an online gambling account that hasn’t been closed or severely restricted, the company believes you are a loser. It must be hard to win big with the types of bet I’ve been restricted to. That might explain why sports multis are advertised so heavily – they’re hard to win consistently and appeal to the most casual gamblers. Independent bookies are obliged to bet to lose a certain amount (which could be around $1000-$5000 depending on the venue), while these corporates can do as they please. We grant these companies licences that allow them to fleece us without their having to take much risk in return. That’s inconsistent at best, and pokies-level shameful at worst. I’m not complaining, Travis. 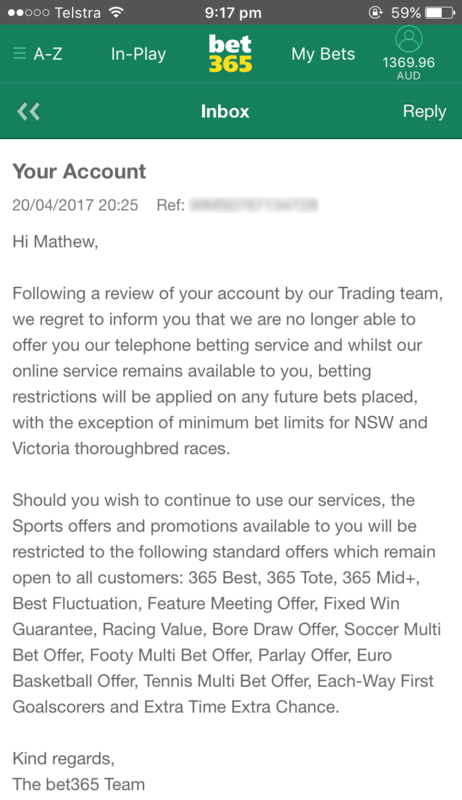 Bet365 had the right to cut me off, and I knew it – I’d heard the stories and wanted to see it for myself. The governments that grant licences under such terms ought to pull their bloody socks up, though. And the next time you’re projected onto a building would you let your fellow members know that they’re being treated like mugs? When people used paper to manage their workplace footy tipping competitions they needed a simple method to decide tiebreakers. The closest guess to the margin of the round’s blockbuster game was usually the way to sort end-of-week results, and this was sometimes used cumulatively to sort end-of-season results. Many online competitions follow this tradition and still use the same method to separate contestants on the same number of wins. It’s OK, but it could be improved. Now that tipping systems are automated why not rely on the computer to provide a better ranking of participants? The problem as I see it: Imagine two participants tip eight of nine games correctly. Participant A’s incorrect tip was in a game decided by a margin of one point, and Participant B incorrectly tipped a game decided by a margin of 80 points. Both participants were wrong about one game, but Participant B was “more wrong”. This, I think, ought to come into play for tiebreakers before worrying about choosing margins of blockbuster games. My suggestion is for a ‘tip quality’ figure (TQ), based on a similar principle to the AFL ladder’s percentage tiebreaker, to be introduced to separate those contestants on the same base score. For each correct tip, the participant’s TQ will increase according to a function of that game’s margin. For each incorrect tip, the participant’s TQ will decrease likewise. The competitor with the higher TQ will win any required tiebreak. Initially I had imagined a simple calculation – that all margins in games tipped correctly be summed and added to the competitor’s TQ, and all margins in games tipped incorrectly be summed and subtracted from their TQ. However, margin alone is inadequate – TQ would need to consider the margin as a percentage of the combined total score of both teams to provide an adequate gauge. All three games were decided by a margin of twenty points, but while Carlton beat Collingwood by a margin equal to 10% of the total score, Melbourne beat St Kilda by 20% of the total score, and Fremantle beat Sydney by a whopping 50% of the total score. While there are many in-game variables that fans would consider when determining which game was the best match, all that a computer can go on is the raw score, which is appropriate anyway since it is score alone that decides the result. By that metric, Fremantle had the greater win. Here is an example from the AFL (Round 1, 2015). Both participants tipped five games correctly, but while Participant A’s incorrect tips were in reasonably close games, Participant B tipped a side that was flogged by twelve goals. 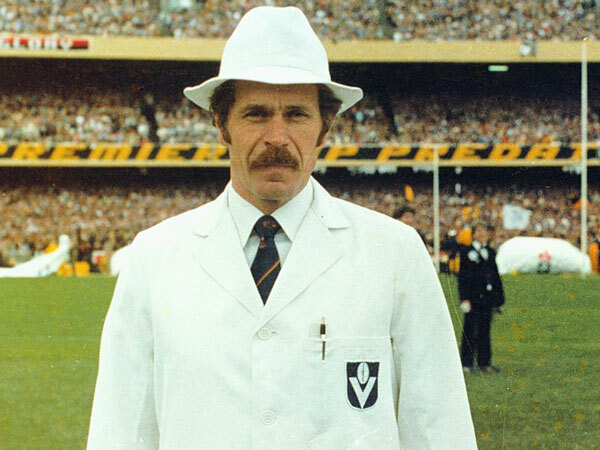 The first game was Carlton vs Richmond. Both participants correctly tipped Richmond, who won by a margin of 27 points, or 14.75% of the 183 points scored in the game. For TQ purposes this figure is taken and used as a raw number (not a percentage), so 14.75 is added to their TQ. The seventh game was Adelaide vs North Melbourne. The Crows won by a margin of 77 points, or 37.93% of the 203 points scored in the match. Participant A picked this correctly and had 39.93 added to their TQ. Participant B picked incorrectly and had 39.93 subtracted from their TQ. At the end of Round 1, Participant A achieved a TQ of 80.14, which puts them ahead of Participant B’s 19.28, and via a TQ tiebreaker gives them the win for the week. For any individual week the score would be reset, but a cumulative value would be calculated over the course of the season to provide an end-of-year TQ value for each tipster, providing a tiebreaker for the final standings. The TQ is less useful in an individual round than it is over the course of a whole season, since people are more likely to pick the same combination of results in a single week. The “guess the margin” option could still be employed as a further tiebreaker in that scenario, and I think this is a fairer check to apply before resorting to that method. Over the course of a home-and-away season it is unlikely that two people will have tipped the same combination of teams, so it provides an excellent tiebreaker. In the cutthroat world of footy tipping, with pride and money at stake, a tiebreaker that better reflects the skill (or fortune) of the competitors would be welcome, and a relatively simple task for an online tipping system to provide.